Earlier this summer we bought some tomato plants. It was too late to make a garden to plant them so they stayed in their rich potting soil, received great sunlight and were watered (usually). They flowered quite a bit and produced a couple tomatoes. Mostly they just sat there. The fall came along with the threat of the first frost. Since they were still in planters, we have started shuffling them in and outside. They don’t get as much sun, and sometimes not as much water. 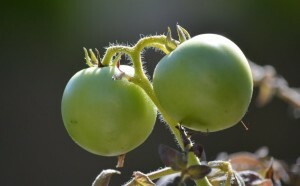 Life got rougher, but since this time, more and more tomatoes have appeared on the plant (pictured). We tend to think that if you give plants fertile soil, plenty of sun and water, then we’ll reap a big harvest. But plants give off the most fruit when they are challenged by their environment. This is also true of us. The French word ennui represents the boredom that comes from lacking challenge, or excitement. It’s what we feel when there is no drama, no challenge, nothing we can step up to. Like the tomatoes, we do best when we are surrounded by a healthy amount of difficulty. Not so much that we wither, but enough to encourage us to grow. It is in challenges that we learn more about ourselves and life. Difficulties are not a curse, but part of the joys of life.